3D printing technology is emerging very quickly and many companies and designers are researching for a low budget 3D printing process. The new Kickstarter 3D scanner presents a new initiative in order to build an affordable desktop 3D scanner for both hobbyists and professionals. The 3D scanner can save much time and effort by 3D scanning existing objects instead of modeling them from scratch. While there are many initiatives to build an affordable Kickstarter 3D printer, few are focusing on the 3D scanning process. Shining 3D is one of the leading companies in the 3D scanning industry. 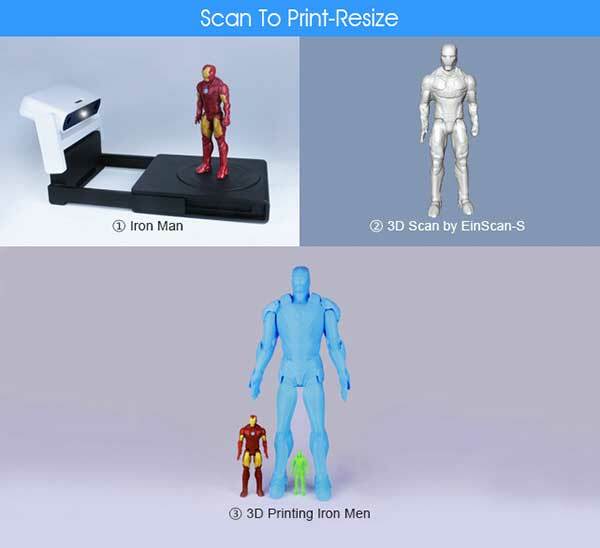 Recently, the company released EinScan-S, a new desktop 3D scanner. The company aims to create a high quality 3D scanner with an affordable cost. A Kickstarter project has been initiated to get funding for the new 3D scanner. Currently, the project gained more than $63,000, which exceeds its pledged goal of $50,000. More than 100 backers have supported the project and it is still gaining momentum at this moment of writing this article. The Kickstarter 3D scanner aims to achieve accuracy resolution and speed. The company claims that the current desktop 3D laser digitalizer’s’ performance is not suitable for the design process. Also, the industrial 3D scanner is very expensive for many designers. The third reason for creating the 3D scanner is that the current laser light is very strong on the eyes and it is not safe for children. Maximum scan size is 700x700x700mm for free scan and 215x215x215mm for automatic scan. Alignment methods include automatic align, features align and manual align. The EinScan-S 3D scanner uses a white light scan technique, which helps in reducing noise while creating more accurate details. The size of the 3D scanner and its shape make it suitable to put on desktop and in small spaces. The quality produced from the EinScan-S makes it quit competitive because the laser digitalizes effectively and as it is targeted to the 3D printer users. The Kickstart 3D scanner can be a good start for similar projects especially with the success achieved in the first few days of the release of the project.